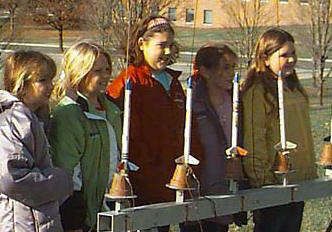 What makes our Bulk Pack rocket kits perfect for class building and flying? 1. That's what they were designed for. 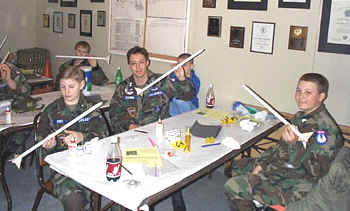 Our kits were intended right from the start for classroom situations. 99% of them are sold in bulk packs. They are intended to be built in a situation where a lot of them are being built at once by relatively unskilled hands. All materials are extra strong. Our body tubes are three times thicker than other manufacturers' kit tubes. Our nose cones are vacuum-molded plastic shells with cardboard shoulders. We use Kevlar cord instead of elastic for shock cord, 8 mil plastic for streamers, and 1/8 hard balsa for fins. Every kit includes a Nomex Heatshield so you don't need recovery wadding. These rockets will fly more than once! 2. They are designed for small field flying with economical motors. Take them out on your school soccer field. Our kits are tested on small school fields, and designed so that they don't float into the trees or onto the roof. That's why we use streamers instead of parachutes: streamers bring the model down closer to the pad. They also come down faster, so we use stronger materials to make sure the rockets survive to fly another day. 3. We've been listening to teachers for 10 years. 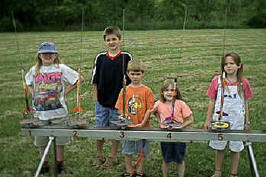 Our most popular kit, the Super Six, was published in "Basics of Model Rocketry" in 1982. We've been producing it commercially since 1995. Over the years, we have received a lot of fantastic suggestions on how to improve it, everything from tweaking the instructions to adding whole new subassemblies. It is now a darn fine product, with a proud history. All the small parts come pre-bagged. You don't get a huge bag of launch lugs that have to be handed out one at a time. All you have to hand out is a tube, a nose cone, and a parts bag. 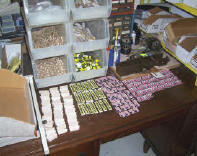 All our kits include a color kit sticker, an American flag, and a Union Jack. We're proud to live in the civilization that sends men to the Moon and rovers to Mars. Every bulk pack has a spare parts bag with a few of the extras that tend to get lost. Every bulk pack has at least one extra kit. You never know when someone might show up unannounced...and besides, the teacher should get to build one too! Why should the kids have all the fun? 4. They are an excellent value. We have kept the cost of our kits as low as possible, since school budgets are never as big as they should be! We include one set of instructions, printed as single sheets on high quality paper, in each bulk pack. Every school has a photocopier, and many teachers have told us that they would prefer to run off as many copies as they need, rather than pay to have a big stack of instructions shipped to them. Thanks to our association with Quest Aerospace, we have a source of very high quality model rocket motors in economical bulk packs. We can even supply launch systems designed for your specific needs and budget.